53 athletes from 12 countries were once again welcomed by great conditions for the second leg of the FIS Nordic Combined Continental Cup in Planica. This was the 13th competition of the season, the last before the final three in Nizhny Tagil, Russia. German Terence Weber who finished on the podium yesterday, was in the lead after ski jumping (133.5 m) with a 3.8 point advantage (15 seconds) over Harald Johnas Riiber of Norway (136.0 m). Yesterday’s winner Austrian Lukas Klapfer landed at 132.0 meters which gave him 125 points and a 37 second deficit for the second part of the competition. But this margin wasn’t big enough to stop Klapfer getting another first place. 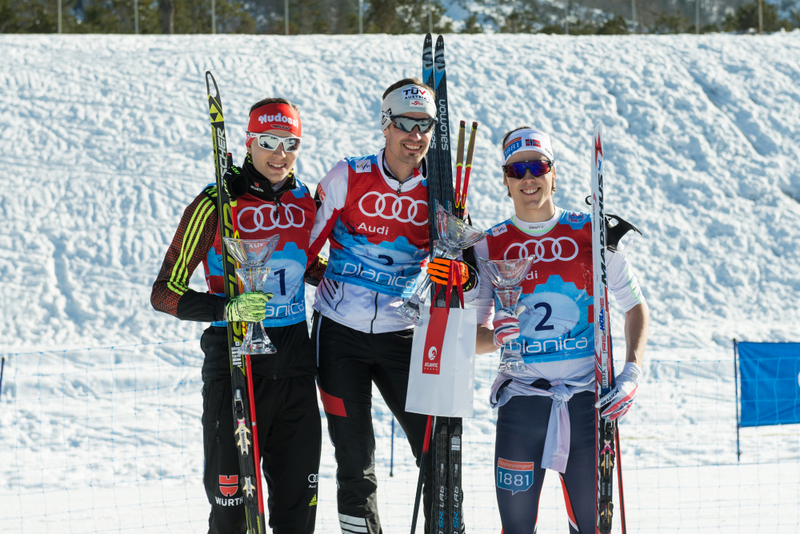 The Austrian started the last of five 2-kilometre laps together with Weber but was again faster on skis. At the end he finished 8 seconds ahead of German, while Riiber managed to take the third place with 14.7 seconds behind the winner. The best Slovenian result came by the hands and legs of Vid Vrhovnik, who finished in 18th place.